“Trips to combat zones should be preceded by long and extensive buildups, weeks of exhausting training, equipment and personnel preparation, location orientation, and so forth”. In a nutshell: They need INTELLIGENCE. Before leaving for an on-site HDTV signal survey, the engineer or technician, conducting the tests and measurements, needs, up-to-date and specific information, such as distance and direction of the desired and undesired (co-channel) TV stations, output power, transmit antenna height, frequency offset, call letters and network affiliation. With other words, the survey engineer needs INFORMATION. Without supporting technical information the survey engineer may miss desired stations, may not investigate over-optimistic test results. In the good old days of CATV, the early sixties, preparation for an on-site TV reception signal survey represented a full day engineering effort. Desired and undesired (co-channel) stations were identified from a large aeronautical map, covering the entire wall of the office. Transmitter parameters, station affiliation information were looked up in the TV Factbook. Distances and directions were measured manually on the map, their accuracy a function of the engineer’s devotion and diligence. The search for transmission parameters and station affiliations in the TV Factbook has taken long hours. Finally the collected information had to be organized into an acceptable format, adding an extra hour to the process. These days, in the 21st Century, the information collection may require much less time, while its accuracy improved more than tenfold. The information preparation process should start with the verification of the site coordinates. Improper coordinates can create havoc with a computer aided TV Reception Study. 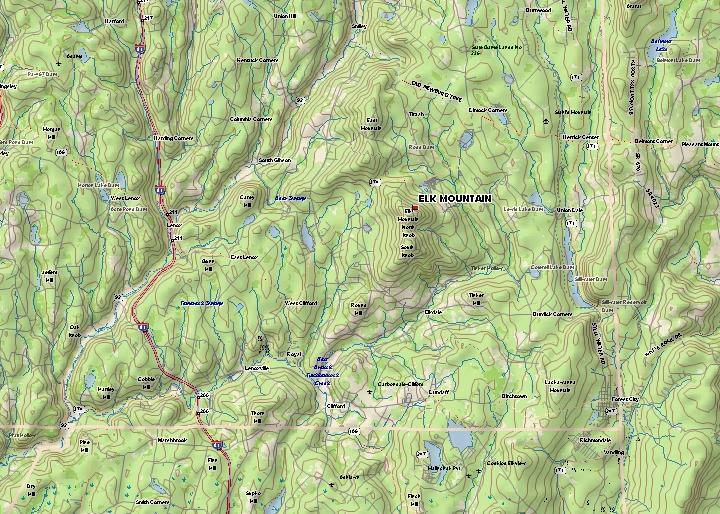 Assuming that the selected location has the correct address, the coordinates and elevation of the site can be conveniently and precisely identified from the computer developed large scale (1:100,000) topo map. 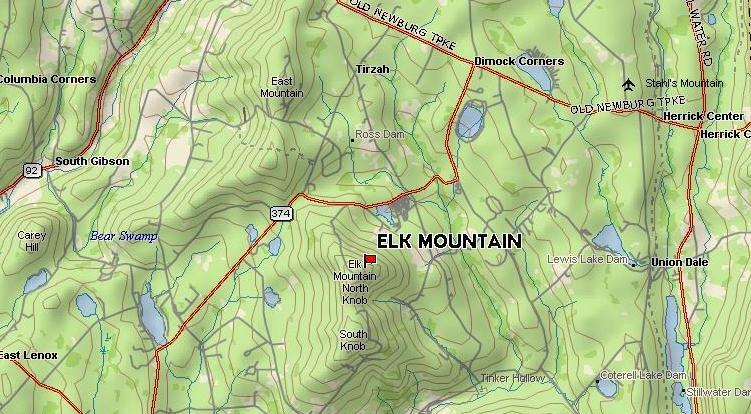 Changing the scale of the map to 1:200,000, a larger area will be displayed, showing mountain peaks and higher elevation ridges in the surrounding area, warning the survey engineer of reception difficulties, generated by line-of-sight limitations. A large scale map of the same area. 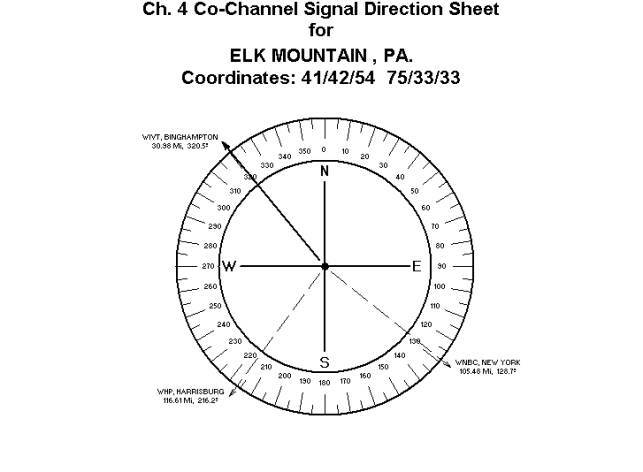 Knowing the exact coordinates of the selected location, Signal Direction Sheets can be developed, showing the exact directions and distances of the analog and DTV stations within a 75 mile radius (The radius can be reduced to 50 miles, or extended to 100 miles, on demand). 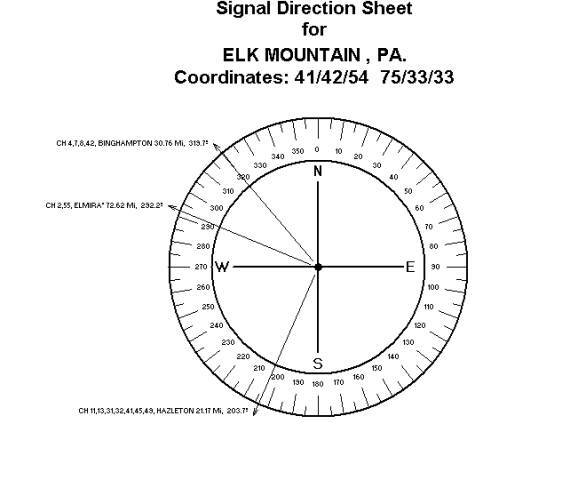 The computer developed and printed Signal Direction Sheet for ELK MOUNTAIN, Pa. displayed all analog and DTV stations within 75 miles. Distance accuracy is better than 0.01 miles, deviation from the exact directions less than 0.1 degree. The fact that all Scranton analog and DTV stations are in the same direction indicates to the survey engineer that once the test antenna was properly oriented toward a selected analog or HDTV UHF station, it does not have to be moved again. 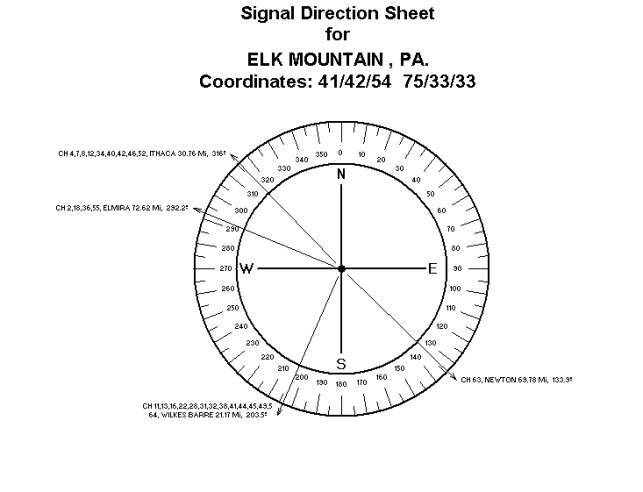 The computer generated Signal Direction Sheet on hand can save time while enhancing the reliability of the field work. Should the survey engineer prefer a separate search of the HDTV stations, the above Signal Direction Sheet is the best possible tool in speeding up the process, while making sure that all DTV stations were counted for. When the selected location has an elevation of 2543 ft above sea level, producing perfect line-of-sight conditions, signal levels of the desired stations are usually not a major concern. On the other hand, the high elevation may expose TV reception to serious co-channel interference, the influx of undesired distant TV stations.. Therefore, a search for potential co-channel interference offenders should be an integral part of a professionally conducted on-site TV reception signal survey. Without the proper information on hand the identification of the co-channel offenders can be a time consuming task and the results open for second guessing. Having the co-channel signal direction sheet next to the spectrum analyzer, the survey engineer can precisely orient the antenna into the direction of the suspected offender, take an interference intensity reading and make picture quality observations. The Channel 4, WIVT, Binghamton reception is predicted to be affected by two offenders, Channel 4, New York and Channel 4, Harrisburg. The correct orientation of the test antenna, based on the Signal Direction Sheet’s information can reduce test time on site. The case of Channel 8, WICZ, Binghamton is a classical Front/Back ratio problem. 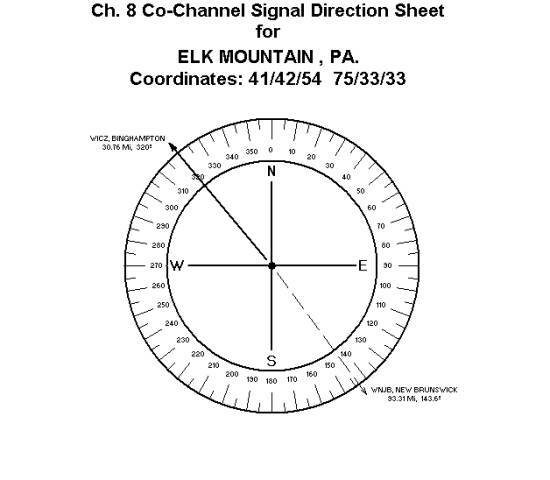 The Signal Direction Sheet displayed an almost perfect 180° relative angle direction of the offender, Channel 8, New Brunswick. The staff of Biro Engineering is constantly updating our TV database. If you have selected the Biro TV Reception Study, be assured that you have the most comprehensive, computer developed information in preparation for the necessary on-site tests and measurements. Biro Engineering is not sponsored by the Ford Foundation. We have to charge for our professional engineering services. On the other hand, should your company decide to let the signal survey to be conducted by the “experts”, the charges for the TV Reception Study will be deducted from the final bill.